Add the frozen berries, honey and water into a small saucepan and heat on medium/low setting and simmer for 10 minutes. Mix the cream cheese and lemon cottage cheese together in a large bowl. 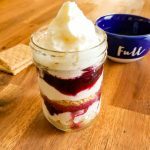 In a small cup or mason jar, layer the toppings, add the crushed graham crackers, then cream cheese mixture, then the berries and repeat.